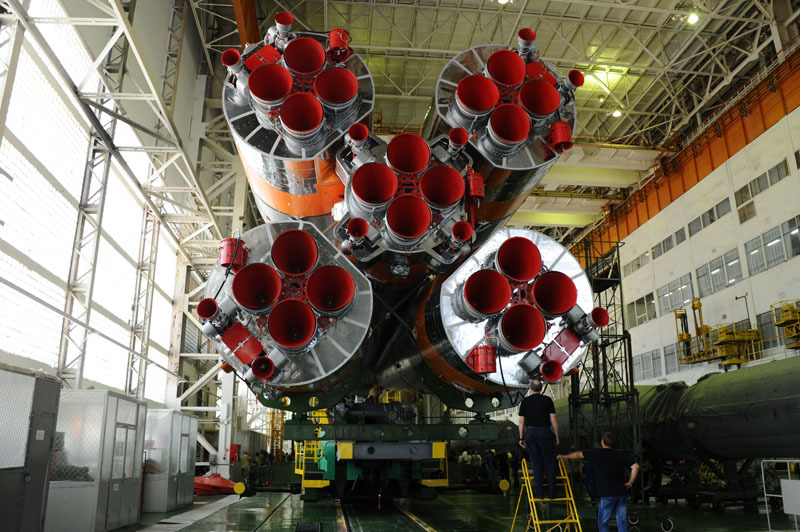 Soyuz 2-1A is the next-generation of the Russian workhorse Soyuz Launcher. It is nearly identical to previously flown Soyuz launchers, but features an upgraded Control System switching from analog to digital control system to make the Soyuz Launcher more flexible. The vehicle is a member of the Soyuz Rocket Family that has a history dating back to 1957. Soyuz launchers have been derived from the R-7 missile that was developed during the Cold War making 28 launches between 1957 and 1961. There have been various different versions of the Soyuz Launcher. 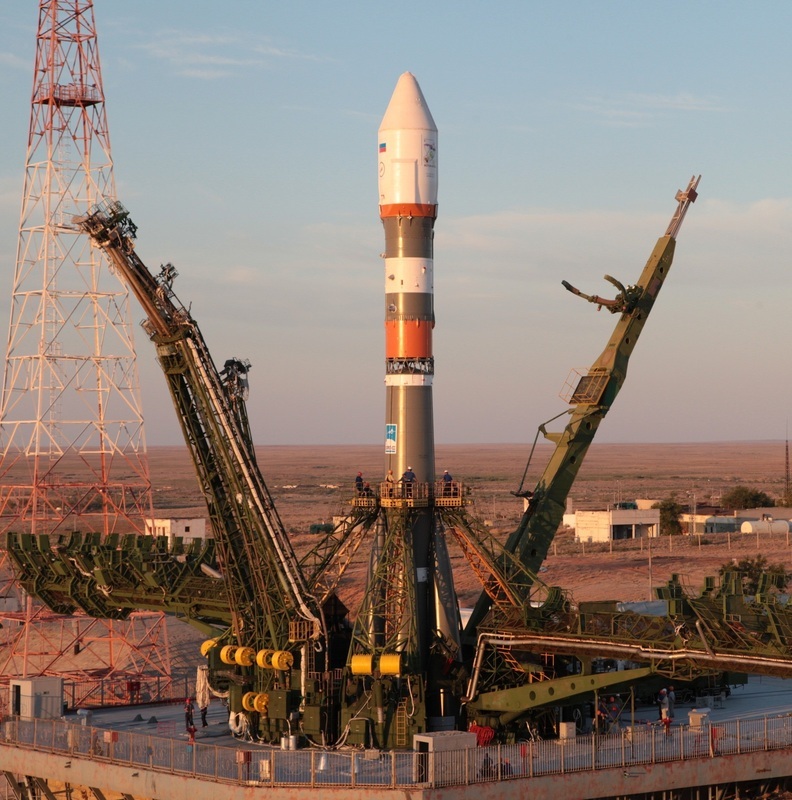 The Soyuz 2 Launcher Family is currently operating alongside the Soyuz-U and FG Launcher and is planned to replace these vehicles once they are phased out. Soyuz 2-1A Rockets are being operated from the Baikonur Cosmodrome (LC-31), LC-43 at Plesetsk Cosmodrome and the Kourou Space Center in French Guiana. The Launcher is available to Russian Government Customers as well as commercial customers via the Arianespace affiliate Starsem that operated the Soyuz launcher. 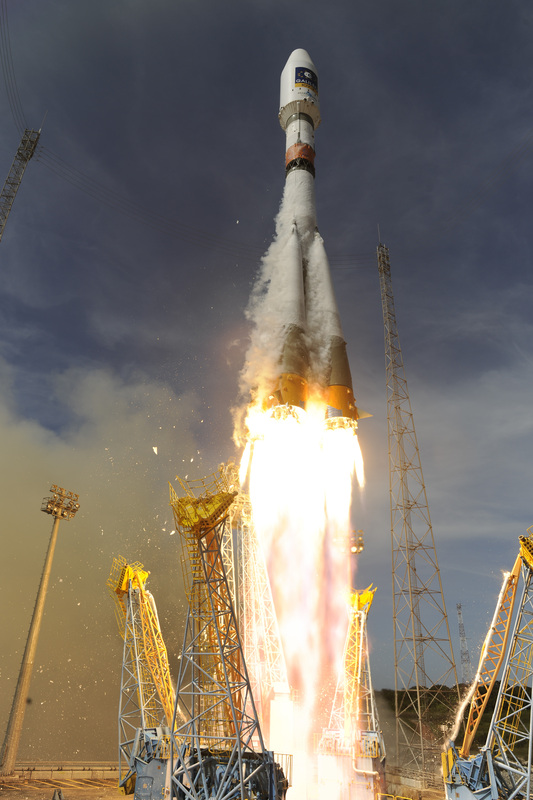 With its new digital control system, Soyuz 2-1A can perform more flexible Ascent Missions. The old Soyuz Launchers had to be rotated on their launch tables to the correct launch azimuth angle since their control system was not able to perform a Roll Maneuver early in the flight. With the new digital control System, the launch table does not need to be rotated since the digital control system supports three-axis vehicle control from the point of liftoff. The digital controller also provides more stability during ascent, allowing the Soyuz to be outfitted with larger Payload Fairings enabling it to carry bigger payloads. 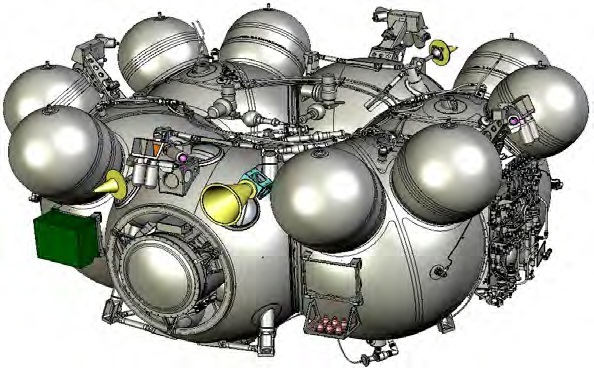 The old Soyuz control system was unable to handle the instabilities caused by a larger fairing. In addition, the Soyuz 2 generation of vehicles provides a significantly higher injection accuracy that is important for direct-to-orbit flights. Soyuz 2-1A is usually outfitted with a Fregat Upper Stage that features its own autonomous control system that takes over after the Soyuz has released the Orbital Unit. Fregat provides more injection accuracy and is able to make several engine burns during the flight to allow payloads to be delivered to a variety of orbits including Low Earth Orbit, Sun-Synchronous Orbit, Geosynchronous transfer orbit and Geosynchronous Orbit. By launching from three Launch Sites around the Globe, Soyuz 2 can target a variety of orbital inclinations. The Soyuz-2 Vehicle stands 46.1 meters tall and has a main diameter of 2.95 meters and a span of 10.3 meters from booster fin to booster fin. All stages of the vehicle use Rocket Propellant 1 (Rocket-Grade Kerosene) and Liquid Oxygen as propellants. 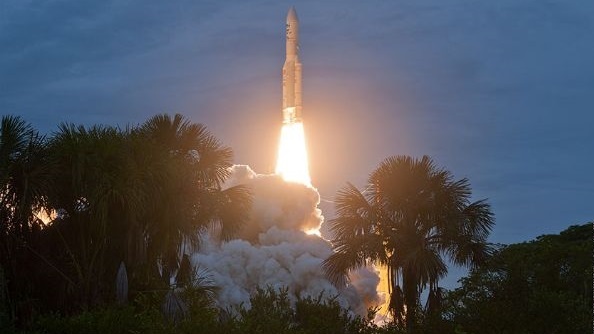 Liftoff mass is about 303,000 Kilograms -. excluding payload and Fregat Upper Stage mass. The 2-1A version of the Soyuz can deliver payloads of up to 7,800 Kilograms to Low Earth Orbit featuring a slightly improved performance over the previous Soyuz Vehicles, making it suitable for cargo flights to the Space Station with increased cargo upmass as well as future crewed missions when qualification of the vehicle is complete. With an appropriate Upper Stage like Fregat, Soyuz can reach a variety of orbits including Sun Synchronous, Medium Earth and Geostationary Transfer Orbit. Soyuz 2 is outfitted with four liquid fueled strap-on boosters providing extra lift during the initial phase of the flight. All four boosters are ignited before liftoff to reach full thrust and are jettisoned once their fuel tanks are empty. 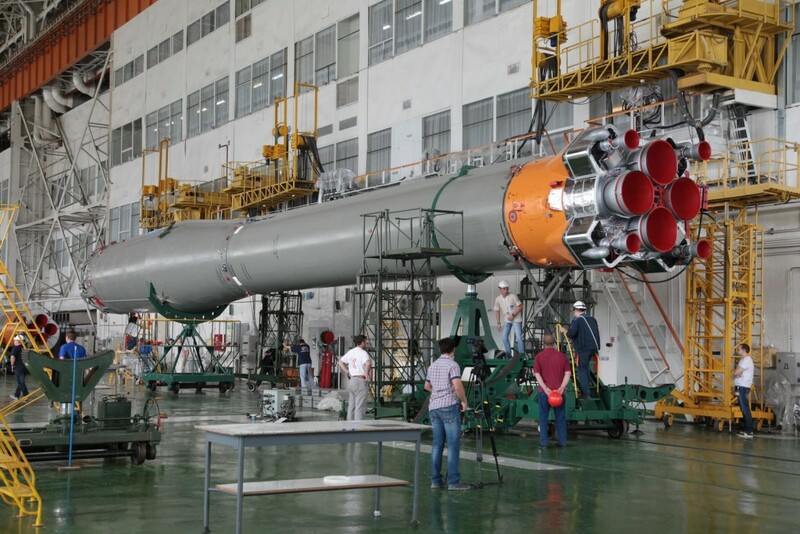 The boosters are arranged around the central Core Stage and are tapered cylinders. The Oxidizer Tank is in the tapered portion of the booster while the fuel tank is inside the cylindrical portion. Each booster holds a total of 39,160 Kilograms of Propellants which are Liquid Oxygen and Rocket Propellant 1. A Soyuz Booster is 19.6 meters in length and 2.68 meters in diameter. An RD-107A Engine is installed on each booster providing a thrust of 837.5 Kilonewtons at Liftoff. 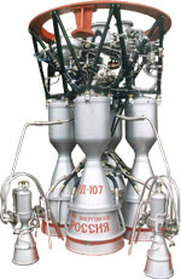 RD-107A is an improved version with more efficient fuel injection, but it is very similar to the RD-107 engines of previous Soyuz Launchers. The engine utilizes a spark ignition system and can not be re-started. 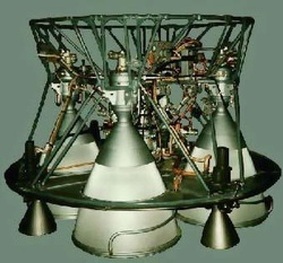 RD-107A features four combustion chambers that are fed by a Turbopump transferring 91 Kilograms of Kerosene and 226 Kilograms of Oxygen every second. Several auxiliary pumps are used to keep the Propellant Tanks at flight pressure by feeding them with vaporized Nitrogen. Another pump delivers Hydrogen Peroxide to the main pump to power it. A total of 1,190 kilograms of Hydrogen Peroxide and 280 Kilograms of liquid Nitrogen are stored inside spherical tanks and are expended during ascent for the aforementioned purposes. The Turbopump spins at over 8,000rpm at flight speed. 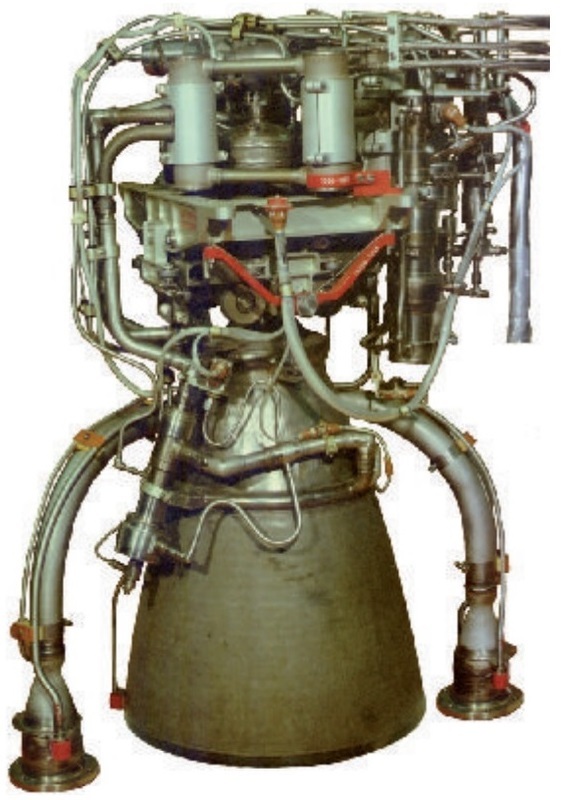 The four nozzles of the RD-107A can not be gimbaled, but the engine is outfitted with two 35kN vernier jets that can be used for attitude control. Also, an aerofin is installed on the base of the booster and also contributes to attitude stability. The engine has a dry weight of 1,250 Kilograms and is 2.57 meters in length and 1.58 meters in diameter. All boosters ignite about 17 seconds before launch to allow the Turbopumps to spin up to flight speed. Also, the engines are being monitored during that period to make sure performance is nominal. 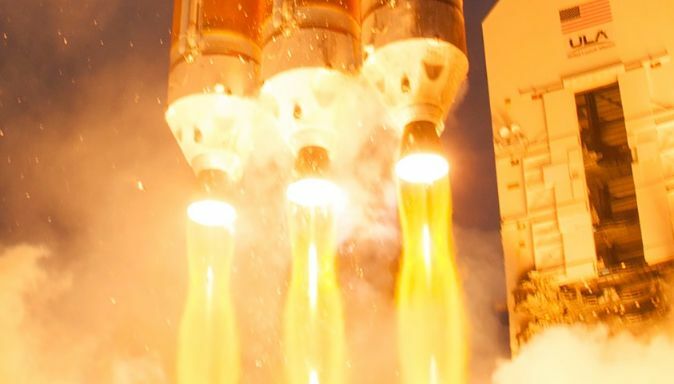 The Boosters Burn for 118 seconds following liftoff before being separated from the launch vehicle and impacting downrange. The Core Stage is 27.8 meters long and 2.95 meters in diameter. It is equipped with a large Oxidizer Tank and a Fuel Tank beneath it, both holding a total of 90,200 Kilograms of Propellants. Where the boosters interface with the core stage, a load carrying ring is installed to transfer loads from the boosters to the vehicle. On top of the core stage is a Truss Segment that interfaces with the upper stage and includes stage separation mechanisms. The core stage is powered by an RD-108A Engine which is similar to the Booster Main Engine. It also features four combustion chambers and the same pump design. The main Turbopump is also powered by Hydrogen Peroxide. 2,600 Kilograms are consumed during the burn of the stage. 520 Kilograms of liquid Nitrogen are used to keep the Propellant Tanks at flight pressure during the ascent. RD-108A provides 792.5 Kilonewtons of Thrust at Launch. Vacuum Thrust is 990.2 Kilonewtons making the engine slightly more powerful than the RD-108 engine. The Engine has a dry weight of 1,075 Kilograms and operates at a chamber pressure of 55.5 bar. Four 35kN Vernier Engines can be gimbaled to provide three-axis-attitude control during the ascent phase of the mission. The first stage is ignited 17 seconds before liftoff for performance monitoring. The Stage burns for 290 seconds before separating from the third stage. The two stages are separated by igniting the third stage to push the core stage away from the stack. During second stage flight, the protective Payload Fairing is jettisoned to increase launcher performance. 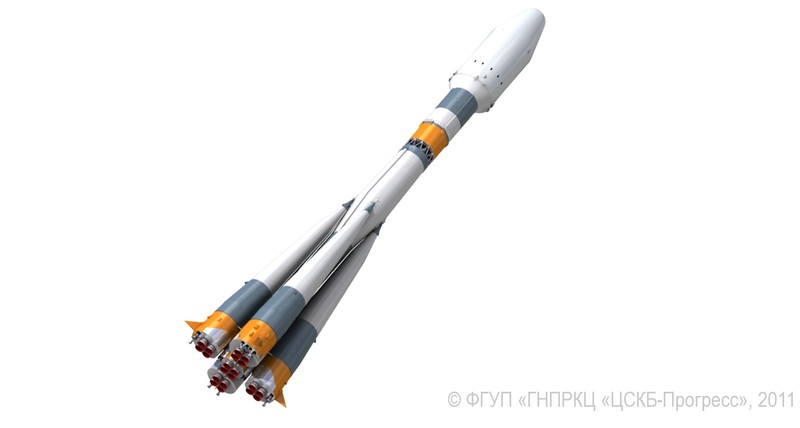 The third stage of the Soyuz 2 is similar in architecture to that of the Soyuz U Launcher and is 6.74 meters in length and 2.66 meters in diameter. Instead of using a spherical fuel tank sitting atop the oxidizer tank, the modified Block I stage features a Kerosene tank with a flat aft bulkhead, a cylindrical section and an forward bulkhead – welded together to increase the capacity of the tank. This also allowed the cylindrical section of the oxidizer tank to be stretched to hold more propellant. 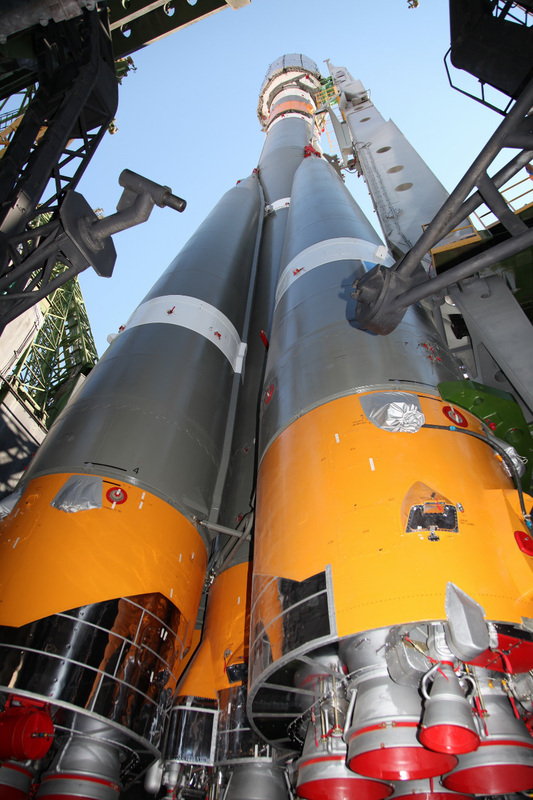 The Avionics of the Soyuz Launcher are also installed on the Upper Stage. These present the main difference between Soyuz 2 and other versions. The control system features a digital onboard computer providing all vehicle commanding and guidance is provided by a 4-axis Inertial Measurement Unit. The control equipment provides vehicle control, telemetry and navigation for the entire flight and issue all vehicle commands autonomously. The equipment is located in the area between the two propellant tanks inside a small equipment bay. The third stage tanks are capable of holding 25,400 Kilograms of Propellants. An RD-0110 Engine is installed on the upper stage. 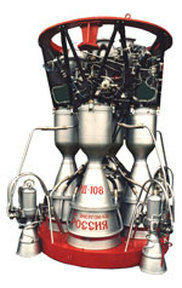 This engine is different from the other engine types used on the Soyuz Vehicle as it is a Gas Generator Type Main Engine. It also has four combustion chambers and provides a total thrust of 297.9 Kilonewtons. The single Turbopump of the RD-0110 is powered by gas from combustion of the main propellants, Rocket Propellant 1 and Liquid Oxygen. The Gas Generator enables the main Turbopump to spin at up to 18,400rpm. After moving through the Turbopump, the gases from the generator are recovered and used in four attitude control thrusters. Each of the thrusters provides 6 Kilonewtons of Thrust and can be gimbaled. The Payload Fairing is positioned on top of the stacked vehicle and its integrated payloads. It protects satellites or other spacecraft against aerodynamic, thermal and acoustic environments that the vehicle experiences during atmospheric flight. When the launcher has left the atmosphere, the fairing is jettisoned by pyrotechnically initiated systems. 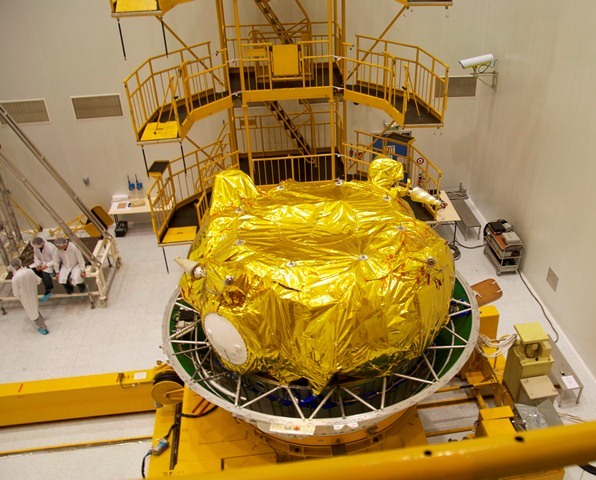 It is separated during second stage flight. At that point, aerodynamic and thermal loads are acceptable for the spacecraft to be exposed after the launcher has left the dense portion of the atmosphere. 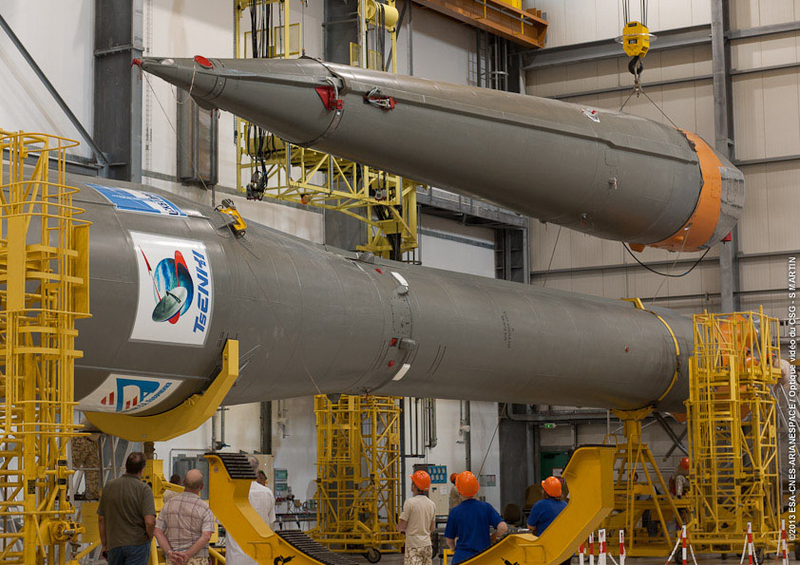 For the Soyuz 2-1A, there are two basic versions of the Payload Fairing, the conventional S-Type Fairing that is 7.7 meters in length and 3.72 meters in diameter or a longer ST-Fairing that is 11.43 meters long and 4.1 meters in diameter.